Serotonin is nature's own appetite suppressant. This powerful brain chemical curbs cravings and shuts off appetite. It makes you feel satisfied even if your stomach is not full. The result is eating less and losing weight. But carbohydrates tip the odds in tryptophan's favor. All carbohydrates (except fruit) are digested to glucose in the intestinal tract. When glucose enters the bloodstream, insulin is released and pushes nutrients such as amino acids into the cells of the heart, liver and other organs. As it does this, tryptophan stays behind in the bloodstream. Now there is more tryptophan in the blood than the competing amino acids. As the blood passes by the barrier into the brain, tryptophan can get in. The tryptophan is immediately converted to serotonin, and the soothing and appetite controlling effects of this brain chemical are soon felt.Our studies with volunteers found that when people consumed a pre-meal carbohydrate drink that made more serotonin, they became less hungry and were able to control their calorie intake. Volunteers whose drinks contained protein -- so that serotonin was not made -- did not experience any decrease in their appetite. Most of us have experienced the carbohydrate-serotonin effect on our appetite even though we were not aware of the connection. Have you ever munched on rolls or bread while waiting for the main course to be served in a restaurant? By the time dinner is served, twenty minutes or so after you ate the roll, your appetite has been downsized. "I don't even feel that hungry" is a common response when the plate is put down on the table. The carbohydrate-serotonin connection has a direct impact on our emotional state, too. Drugs that increase serotonin activity have been used for several decades as a therapy for mood disorders. However, our studies showed that natural changes in serotonin could have a profound impact on daily fluctuations in mood, energy levels and attention. In one of our early studies, we found that our volunteers became slightly depressed, anxious, tired, and irritable around 3 to 5 pm every day. At the same time, they experienced, in the words of one volunteer "a jaw-aching need to eat something sweet or starchy." Several studies later, we were able to state that late afternoon seems to be a universal carbohydrate-craving time, and people who experience this craving use carbohydrates to "self-medicate" themselves. Carbohydrate cravers who consume a sweet or starchy snack are increasing serotonin naturally. 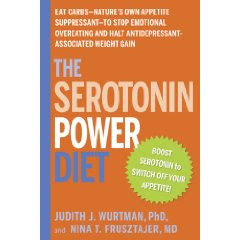 Eating low or fat-free, protein-free carbohydrates in the correct amounts and at specific times potentiates serotonin's ability to increase satiety. You will eat less, feel more satisfied and lose weight. 1.Eat the carbohydrate on an empty stomach to avoid interference from protein from a previous meal or snack. Wait about 3 hours after a meal containing protein. 2.The carbohydrate food such as graham crackers or pretzels should contain between 25-35 grams of carbohydrate. The carbohydrate can be sweet or starchy. High-fiber carbohydrates take a long time to digest and are not recommended for a rapid improvement in mood or decrease in pre-meal appetite. Eat them as part of the daily food plan instead for their nutritional value. 3.The protein content of the snack should not exceed 4 grams. 4.To avoid eating too many calories and slowing down digestion, avoid snacks containing more than 3 grams of fat. 5.Do not continue to eat after you have consumed the correct amount of food. It will take about 20-40 minutes for you to feel the effect. Eating more carbohydrates during the interval is unnecessary and may cause weight gain.